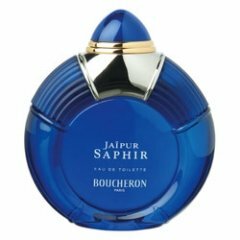 Jaïpur Saphir (Eau de Toilette) is a popular perfume by Boucheron for women and was released in 1999. The scent is floral-oriental. The production was apparently discontinued. Not flowery, not sweet, not sharp; not spicy, not aquatic, not dark; neither cologney nor aromatic; not loud, not fruity, not nutty, not woody; not resinous, not musky; neither dirty nor dusty. No relation whatsoever to its namesake and predecessor, JAIPUR. The only non-negational thing that I can think of to say about JAIPUR SAPHIR edt is that this smells to me like a very subtle unisex niche composition with carefully measured components woven together to form a sort of atmospheric scent which defies deconstruction. I find it impossible to tease out individual distinct notes. It might be very lightly tinged green... then again, maybe not. Write the first Review for Jaïpur Saphir (Eau de Toilette)!